Do you enjoy having cold hands while doing pretty much anything? When it comes to ice climbing and mountaineering, protecting your hands might be one of the most important things there is, yet many people just seem to overlook this delicate matter. They quickly learn the hard way once they find themselves freezing with very cold hands that they really need to wear the best ice climbing gloves if they wished to conquer the snowy tops unscathed. In a very cold setting like ice climbing, you depend on your hands to complete the climb. If they are not well-protected and are instead freezing in the cold, the stiffness could affect your overall climbing performance, which could lead to deadly consequences. High-quality ice climbing gloves will not just keep your hands warm, but will also help you avert other potential injuries. They offer you a good grip on the slippery ice and dexterity needed to handle ice climbing tools. If you’re looking for a treasure trove of information about ice climbing gloves, you should check out the rest of our article. We will recommend to you some top-of-the-line ice climbing gloves that are abrasion resistant and durable so that they can protect your hands not just from the cold weather but also from any unwanted injuries. Plus, we have a short guide about the things you need to take into consideration before picking up a particular pair. Let’s get to it! The capacity to maintain the grip of your tool when climbing is one of the most important things for a pair of gloves. If the gloves don’t have a good dexterity, you might face the danger of getting hurt or worse. That’s why this should be the first thing to consider when buying. Depending on the activity that you will be doing, the grip might be more or less necessary for some cases, like with skiing and snow sports. The best mountaineering gloves are the ones that can withstand the rough conditions and terrains of the mountains you climb. This is also really important because it can make the difference between an investment and a waste of money. Having your gloves get damaged some weeks after you bought them is not good. The intensity of your intended activity is an important consideration whether you need a pair with abrasion resistance or not. If your gloves are not abrasion resistant, they might still have some protection against the hard conditions, so keep this in mind when choosing. This is a plus for some equipment, but you have to remember that in some cases it might play against you. For example, waterproofing is good if you face wet snow, but not as much if you are looking for a very lightweight or breathable fabric. So a certain level of compromise might be needed on your part. Ice picking gloves, although they may not be waterproof, have to be at least water-resistant. Or moisture will seep into the fabric and soak your hands through—which could mean disasters such as hypothermia when you’re out there in the freezing tundra. The level of comfort can influence massively to your outdoor experience. The fabric that is used as well as the fit the gloves have, among other things, influence into the kind of hike or climb you are going to get. The more comfortable and flexible your gloves are, the easier your hike will be because you will not have problems holding the instruments or moving around the rocks and snow. There are a lot of adjustable gloves on the market that could easily suit your needs. One of the main things the gloves need to have is the ability to provide warmth. When doing something at such low temperatures, your hands will surely get cold, and they are one of the easiest parts of the body to get affected by hypothermia first. You also don’t want them to be too hot because it might make your hands sweat too much. Again, this is all about striking a healthy balance. Now that you’ve seen some simple factors to take into account, we will review some popular products to help you pick the best one to suit your needs. 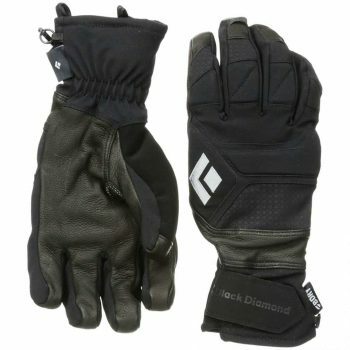 The Black Diamond Punisher Gloves are perfectly designed for your hands to stay protected from the weather, but without getting too warm. This is accomplished by the fixed 100 g fleece lining that allows your hands to be warm enough and protected against the weather, thanks to its waterproof interior. However, due to its very breathable interior, your hands will not get sweaty and wet. 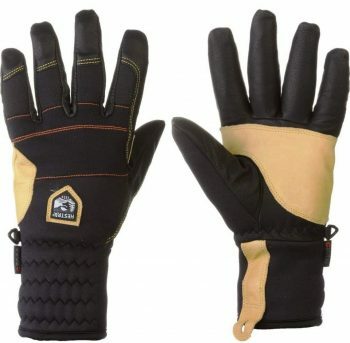 The gloves are very resistant due to their abrasion-resistant stretch nylon back, and its goat leather palm. This makes them perfect for hard alpine climbing and also since they have pre-curved fingers, you can use the winter tools with no problem. The four ways stretch helps your hand adapt easily to the use of the glove, and they feel warm and soft at touch, but still helping your hands stay protected from the outdoor conditions. On the downside, these gloves are designed for more active situations, which is why they might not be as warm as other gloves out there. If you are planning on being active, this would be a good thing, but if not you should take it into account. Related: Ice climbing is a fun activity, but you never know what kind of danger is just around the corner. If worst case scenario you end up having to spend extra days atop the mountain due to a sudden snowstorm or some other reason, these Grizzly Gear Emergency Food Rations will keep you from going hungry. One ration contains 400 calories, and there’s 9 of them in one pack. 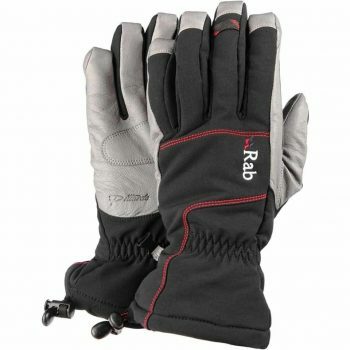 These Rab Baltoro Gloves are perfect for you if your goal is to keep your hands warm during your winter activities. Due to its Matrix DWS outer fabric and the insulation on the back of the hand, your gloves will not only feel warm and comfortable but will also provide freedom of movement for your hands. Also, due to its Pittards Armortan leather that goes through the palm, you will have a great grip on things and would not worry about slipping. It feels like silk on the inside, but it keeps you protected on the outside thanks to the leather reinforcement patch around the areas of critical seams. Lastly, they come with a drawcord cuff closure that keeps your gloves secure during all that movement and over your sleeves quickly. You should consider, however, that the gloves do not have waterproof features, so if you are handling wet ice or unpredictable weather, you might like to invest in some other gloves. Related: The Zeal Slate Goggles will protect your eyes from the glare of the sun reflected off of the ice. They are helmet-compatible, so you can stay safe while climbing without having to deal with any inconveniences. The anti-fog lenses these goggles come with mean you won’t have to keep wiping moisture away to clear your field of vision—a crucial advantage considering both of your hands will probably be busy while ice climbing. The Outdoor Research Alibi II Gloves is surely a crowd pleaser as it has everything you’ll need from a great pair of gloves. They are made out of a nylon stretch softshell in the palm and fingers, and Pittards Oiltac goat leather on the panels on the back of the hand. These materials allow for plenty of movement, and as they have a PrimaLoft One insulation of 170g – you could easily wear these gloves in hard winter. The Gore-Tex technology gives the gloves waterproof and windproof ability, all while also being very breathable. They also dry pretty fast if they do get wet. All these characteristics are perfect if you are facing hard or unpredictable weather when climbing. Also, the gel padding on the outside of the glove, as well as their pre-curved construction allow for a great level of dexterity and a good grip on your climbing tools. It is almost as if you were not using any gloves. On the downside, many people consider that the insulation should not only be on the back of the palm but completely on the glove to provide more warmth. Related: During the winter, the nights are long and the days are short. If you settle for a flashlight that runs solely on solar power, it may end up running out of juice before the day is over. You might want to consider purchasing this MECO Hand Cranking Rechargeable Flashlight instead. It also runs on solar power, but for those emergency situations that often strike out of nowhere, you’ll be glad you’ll have the option of hand-cranking it. The Mountain Hardwear Hydra Gloves have a right balance between warmth and dexterity. The wraparound technology allows for your hand to stay warmer and improves the dexterity by taking the seams away from the fingers, which is the place you need the most warmth and grip. 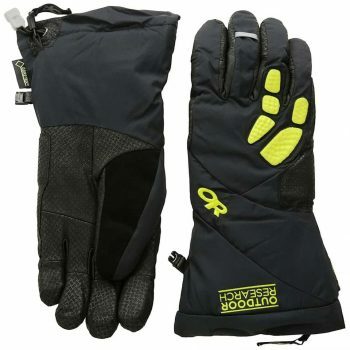 For superior warmth, they have a Thermal.Q Elite Insulation of 180g on the back of the hand, as well as double waterproofing on the palm that helps your hands stay warm and dry while you do your activities in the snow. The gloves are also made from 4-way stretch nylon soft shell fabric, which helps the gloves get a better freedom of movement and a good grip. The leather palm is rugged and very dexterous as well. You should keep in mind, while buying gloves in general and these in particular, that getting the correct size is difficult, so try them on if you can before buying. If you can’t, then look at the size chart and compare the measurements. Related: No one wants to meet with accidents while they are hiking, but the risk is always there. To make sure it won’t turn into a disaster, be prepared by always bringing this Surviveware Small First Aid Kit with you. This first aid kit comes with money back and lifetime guarantee. Let this trusty manufacturer guarantee your safety and well-being. 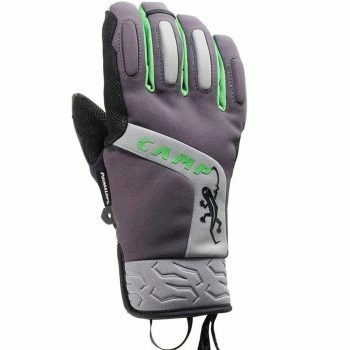 The CAMP GeKo Alpine Gloves are a great option for warm yet comfortable gloves. These are flexible and adjust to the hand of the user, thanks to their microfleece-lined goatskin. This goatskin leather that covers the palm of the hand helps you get a better grip on the instruments and gear you might need. You can also count on keeping your hands warm, as the gloves have a Primaloft synthetic insulation that goes through the back of the palm, keeping your hands nice and warm. This is a great feature when you’re facing really low temperatures and need as much movement as you can get. Also, although not waterproof, they have durable water resistant polyester that helps repel light rain and snow and helps you keep your hands dry and warm. The keeper strap prevents you from losing them while changing gear. They are reinforced around the index finger and the thumb, to help you with the grip and help you conserve the gloves, making them very durable. Related: Although during ice-climbing emergencies you can melt snow and safely drink it, this is not always a viable solution. Perhaps you don’t have any means of starting a fire or perhaps you didn’t even bring any stoves from the first place. It’s always best to have a few of these Datrex Emergency Survival Water Pouches with you just in case. They can last for five years on the shelves, so no worries about drinking bad water. The Hestra Crevasse Glove is designed for hard and active events, so they are perfect for skiing and alpine climbing. The impregnated army goat leather and the kangaroo leather reinforcement allow these gloves to be very comfortable, very safe and also durable, with a great grip to top things off. They are also flexible so you can have a wide range of hand movements, which is a really important feature when you need to handle ice picking tools. The removable wool liner is a great feature because the wool liners help to regulate the temperature in your hands, allowing better breathability. The gloves are not really waterproof or windproof, but they are water-resistant at least and can still help you a lot when in situations of hard snow and winter. The only issue you might have while buying or trying the gloves on is the size, so be sure that you determine this factor before buying. Related: If you’re hunting or camping in the woods, should there be an emergency and you end up having to spend a few extra days outdoors, you can still catch fishes to nourish yourself. Unfortunately, food is not so readily available in the wild when you’re ice climbing. Therefore, always be prepared by carrying a pack of this SOS Food Labs Emergency Rations with you. It’s cinnamon-flavored, and each pack contains more than 3600 Kcal. This ends the review of the best gloves you can use for ice climbing. Ice climbing gloves are important gear if you are planning on climbing the toughest peaks or doing extreme winter sports. Not only do they protect your hands against the hard climate, but they also help to keep your hands protected against the elements such as rocks and snow, and even against the tools and equipment you are handling. That’s why picking the right pair can be a daunting task. We hope that this article has helped you get a better grip on things when it comes to choosing the best climbing gloves.